"It was a vicious foul. Sane was lucky and got away with not getting hurt but such fouls can break bones." Leroy Sane was fortunate to avoid a serious injury after a reckless challenge by Serbia's Milan Pavkov in an international friendly. 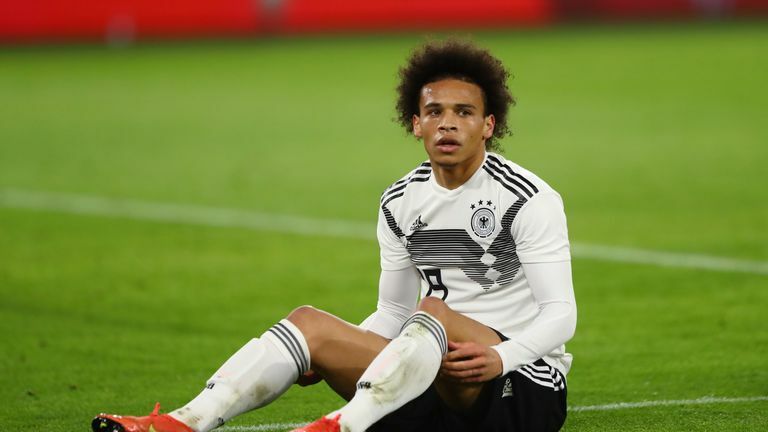 Joachim Low said Leroy Sane "got away with not getting hurt" after a dangerous tackle from Milan Pavkov in Germany's 1-1 draw with Serbia on Wednesday night. Sane was taken off following Pavkov's challenge in injury time, which earned the Serbia player a red card - but Low confirmed the Manchester City winger would be fit for Germany's next game, against the Netherlands on Sunday. The Germany coach told reporters: "It was a vicious foul. Sane was lucky and got away with not getting hurt but such fouls can break bones." Luka Jovic gave Serbia a surprise lead in the first half with a close-range header before substitute Leon Goretzka scored an equaliser, while visiting goalkeeper Marko Dmitrovic made several saves to deny Germany a second goal. The Germans, knocked out of the World Cup in the group stage and relegated in the Nations League last year, had only one player from their 2014 World Cup victory in the starting line-up in Wolfsburg and their oldest outfield player was aged 24. Low was satisfied with the performance of his new-look side despite not recording a victory at the Volkswagen Arena. Highlights of the International friendly between Germany and Serbia. "In the first half the automation in this new team, playing together for the first time, did not function that well," Low said.